Topcoating is a balancing act. Applying a clear finish over bare wood or stain is a big part of the budget on most jobs and a misstep here can be significant. 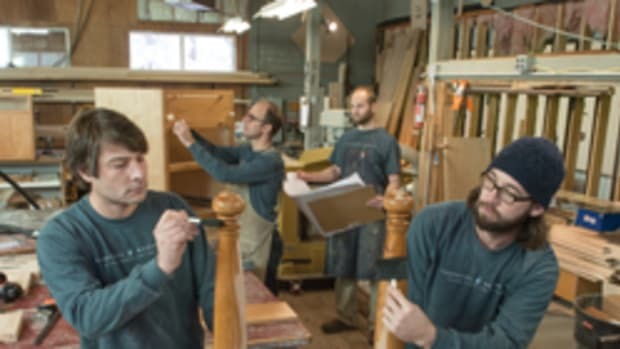 More than one shop has had to strip and refinish an entire kitchen because of poor choices or questionable application practices. Choosing the right topcoat is crucial. There are a number of questions that need answering, beginning with the most pivotal: how will it look? Or last? Some finishes yellow over time. Others crack in sunlight or scratch easily or grow white rings every time a drink is placed on them. Some coatings stay on the surface and protect the wood, but look a little plastic, while others soak into the wood and create a warm, natural and deep finish that isn’t quite as protective. Some wood species simply don’t like or accept all finishes and tend to behave badly when coated. Light-colored woods usually don’t like dark (or darkening over time) finishes such as orange shellac or phenolic varnish. For them, or for highly colored and decorative species, you might want to consider water-based finish or catalyzed lacquer. And coarse-grained species like a thinned finish that can penetrate or they begin to look like a bowling lane. Some topcoats require routine maintenance. Will your customer bother to do that? What level of sheen does the client want — matte, satin, semigloss or high gloss? That has as much to do with scratches, spills and heat as it does looks. And will it stretch? For example, wooden articles that are left outdoors or in many commercial situations (such as poolside in hotels) need to be able to handle direct sunlight and temperature swings, as well as water and snow. All of those climatic factors encourage the wood to move across the grain. Will the finish accommodate that? Then there are the non-aesthetic concerns. How expensive is the coating? How many coats need to be applied? And how easy is it to apply? Spraying is fast, but wasteful. Some finishes, especially varnishes, prefer brushing. Others need to be wiped on, which is labor-intensive, but doesn’t waste much finish. And what about seasonal humidity and temperature changes during the application? Shellac and lacquer are easier to manage in damper or cooler weather, while long-oil varnish can take forever to dry. 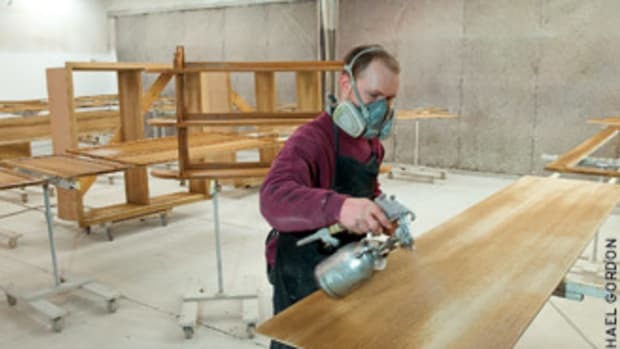 Dust becomes a bigger problem the longer it takes a topcoat to dry because the dust particles land on the surface and slowly sink in until they either get to the wood or the finish dries. Another budget concern is whether the finish you choose can easily be repaired. That’s a bigger issue if the job is under warranty. It’s a balancing act, but there are some basics that can help a woodshop choose the right cabinet topcoat. And those begin with understanding how different finishes dry and what that means over time. Topcoats are grouped into three main categories based on how they harden. In evaporative coatings, a liquid carrier evaporates into the air and the solids that remain form a film — sometimes below the surface, but usually on top. Evaporative topcoats generally dry quickly, but they are not always as tough as they need to be. And one major drawback (although in the repair business it’s often a blessing) is that these coatings will always dissolve in the same solvent that they came from. That sometimes makes them vulnerable to failure if the solvent shows up in their environment. Reactive topcoats actually go through a chemical reaction or change as their solvent dries in contact with air. These coatings won’t dissolve in the original solvent and they are generally more durable and scratch-resistant than evaporative finishes. Water is actually not a solvent. Water-based polyurethane is a good example: it coalesces as it cures. That is, the solvent is something other than water, such as glycol ether, and the solids in a coalescing finish just mix together without chemically reacting. Not really a protective coating, wax (evaporative) is often used over shellac or lacquer to develop a sheen when buffed and also provide routine upkeep. It’s an old-fashioned finish, usually reserved for single pieces such as small boxes or even lathe-turned objects. Waxes come in myriad colors and media: they can be liquid, sticks, pastes and anywhere from white to amber or clear in color. Their sources are minerals, animal fats — even plants such as Brazilian Carnauba fan palm, which exudes a yellow wax prized by many woodworkers. Commercially available liquid and paste waxes are solvent-based and cure as the carrier evaporates. The best way to apply a wax topcoat is with very fine steel wool, followed by buffing with a lint-free soft rag. Let it sit for a while before buffing if you want a bit of a shine. Wax is not a hard or durable finish and needs to be renewed on a regular schedule. It usually won’t retain a sheen and needs to be buffed to reveal any gloss, which eventually fades. Wax is fairly water-repellant as a finish, but has no resistance to heat. Most wax will dissolve in mineral spirits or naphtha. Oils come either as a true oil or a blend. Danish and teak oil are blends that are primarily oil, but they have a little varnish added. That lets them build up a finish a bit faster than a simple penetrating oil, because the larger varnish molecules lie on the surface while the smaller oil molecules enter the pores. Blends are also a bit tougher and the finish they impart is a mixture of the deep, rich look of oil and the sheen of varnish. Danish oil’s base is tung oil. Drying oils such as tung and linseed react with the air (actually with oxygen) to solidify and change their chemical status from liquid to solid. That process is called polymerizing. Raw linseed, by itself, dries too slowly to be a viable cabinet finish, so through the centuries woodworkers figured out that if you boil it first, it will dry in a reasonable time. Nowadays, the boiling process is more chemical than physical: the manufacturers just add drying agents that react upon exposure. Linseed is also known as flaxseed oil because it is extracted from the ripe, dried seeds of flax, a crop plant that also yields both food and fiber (linens) for humans. Tung oil is lighter in tone than linseed and comes from the nuts of the tung tree, which is native to southern China and the surrounding countries. Because of that, it has historically been known as China wood oil. Also found in artist’s oil paints and some printer inks, it’s a little more water-resistant than linseed oil. It is available as both pure (raw), which dries to a wrinkled, checked finish or as a commercially thinned version, which cures to a satin finish after several applications. It doesn’t darken noticeably over time. Mineral oil is a non-drying oil, usually made from a distilled byproduct of petroleum, and is not a viable cabinet finish. It can be used to refresh butcher-block, cutting boards and turned wood bowls that are used to serve or store food. 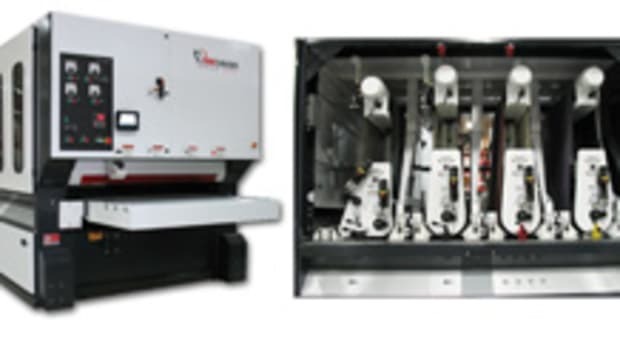 Oil-based (reactive) and water-based (coalescent) varnishes are both viable options for topcoating cabinets. Made by combining a drying oil and a resin with a carrier (thinner/solvent), oil-based varnishes cure by polymerizing — a chemical reaction that forms polymer (small molecule) chains. Compared to water-based varnishes, they are flammable, more polluting and also cause health issues because of organic solvents. 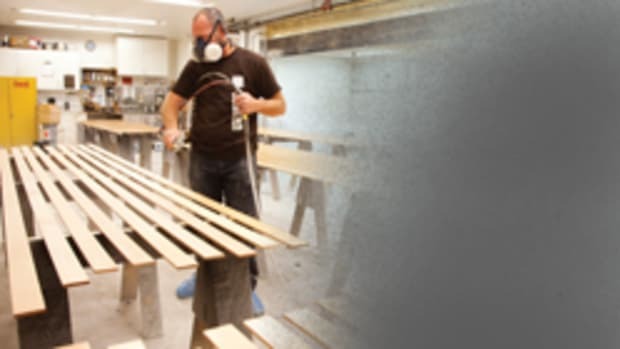 During the last few decades, the wood finishing world has struggled to create an alternative to oil-based sprayed finishes that is less toxic, yet still delivers the same hard and durable protective coating. Most cabinetmakers would say that the manufacturers have come very close. The most common resins in oil-based varnish are urethane, alkyds and phenolic. Urethane perhaps delivers the toughest, most durable finish that is very resistant to heat, moisture and scratching. Alkyd resins are generally found in interior (furniture) varnishes, while phenolic-based resins are used in tung, linseed or even soybean oil-based exterior coatings, along with driers and hardeners. The more oil in the mix (called long oil in the trade), the more flexible and softer the finish. That makes it ideal for exterior applications such as marine or spar varnishes, which need to flex a lot as both they and the wood respond to sun, rain and temperature changes. Short oil varnish, used on cabinets, is usually baked. Polyurethane varnishes substitute urethane polymers (such as impact-resistant polyether or oil-resistant polyester) for unpleasant urethane and are ideal for floors, but some finishers disdain them when it comes to cabinets. They sit on the surface, rather than penetrating the wood, unless primed with oil varnish, wax-free shellac or a clear epoxy-based sealer. Polyurethane varnish (and there are water-based versions) builds up quickly and oil-modified hybrid polyurethanes are the most widely used in floor finishing. They usually don’t work well outdoors. Not seen as being quite as tough or rugged as its oil-based cousins — although many manufacturers would disagree — water-based or “waterborne” varnish is made with acrylic resin or acrylic urethane. It is less toxic, has a smaller environmental impact and is safer to use in terms of fire and explosion. In many ways, water-based varnish shares the characteristics and handling of oil-based varnish. Conversion varnish is a catalyzed, alkyd-based compound. Catalyzing simply means adding a catalyst — a chemical that speeds up a reaction. Wood finishes undergo a chemical bonding known as cross-linking, which results in the molecules bonding together in chains to form the topcoat. These chains add durability and even some water resistance to many finishes. Catalyzing can be done up to several months before use in the manufacturer’s factory (there is a limit to the “pot life” or length of time a finish remains usable) and that’s called precatalyzing. Or the catalyst can be added in the woodshop just before the product is applied (and that’s post-catalyzed). The latter are much stronger mixes with a pot life that is usually just minutes and an hour or so at most. Some catalysts also require an induction period, which gives the chemicals time to start working before they are sprayed. 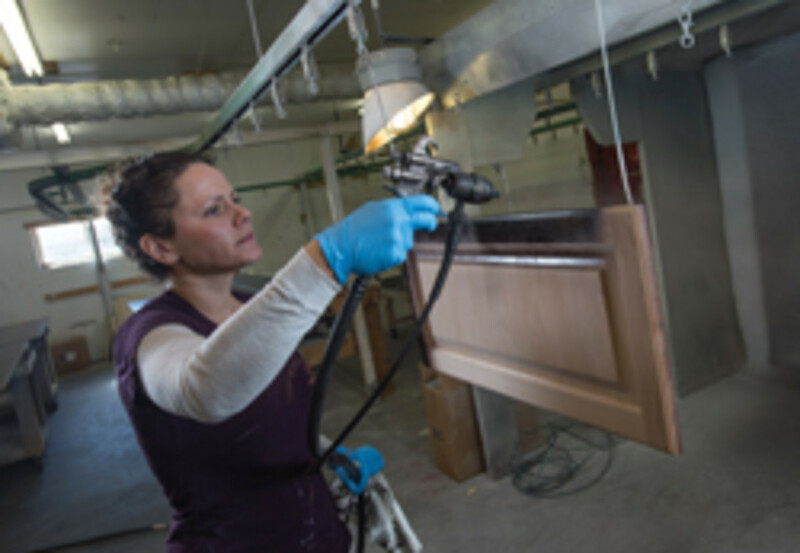 Before choosing any cabinet topcoat, one should take the time to read through the manufacturer’s technical data sheet (TDS) to discover how to use it and the material safety data sheet (MSDS) or product safety data sheet (PSDS) to discover how you — and your employees — can use it safely. The latter isn’t just legal boilerplate: you might need to make some changes to protect people from fumes, fire, allergies and skin problems. Pay particular attention to any notes on formaldehyde or isocyanate emissions. One of the rules that the TDS will spell out is how thick a coating you can spray. That ranges from maybe 3 or 4 mils for vinyl to perhaps 12 to 14 mils for polyesters: read the sheet and don’t use these numbers as a guide, because every product is different. Pay attention to the total thickness recommendation, too: individual coatings can only be built up so far with some products before they start to show signs of cracking. You also need to be aware of the recoating window — how long you must wait before spraying the next coat and sometimes how quickly you must do it. These are usually temperature-sensitive: finishes dry at different rates at different room temperatures and humidity levels. Some shops post a simple chart of drying times on the wall beside a large thermometer that displays approximate rates, just as a reminder. The color of conversion varnish can be somewhat controlled: there are yellowing and non-yellowing varieties. Conversion varnish is post-catalyzed and is quite similar in character to conversion lacquer. The varnish takes a little longer to cure and is a bit tougher and more resistant. Both generally need to be used within hours (and definitely the same day) as the catalyst is added or they will begin to solidify. That happens faster on warmer days. And if you’re spraying over oil-based stains or oily woods, read the TDS to see if the manufacturer recommends using a vinyl sanding sealer to aid adhesion. Catalyzed varnishes lie on top of the previous coat (unlike shellac or lacquers, which “melt” into the previous layer). So they require light, fine sanding between coats for a smooth finish. Polyester isn’t a great cabinet finish. It’s difficult to work with and dents easily. Some shops use it to attain a very high, wet-looking gloss on projects such as signage. Catalyzed polyurethane is either acrylic or polyester resin-based and come in either yellowing or clear versions. It takes a bit longer than catalyzed varnish to dry, gets a bit harder and more durable and can often be laid down thicker. Shellac is a natural finish made from lac bug secretions that are dried and flaked and then dissolved in denatured alcohol (usually ethyl, which is produced from corn — yes, the same family as the gasoline additive ethanol). 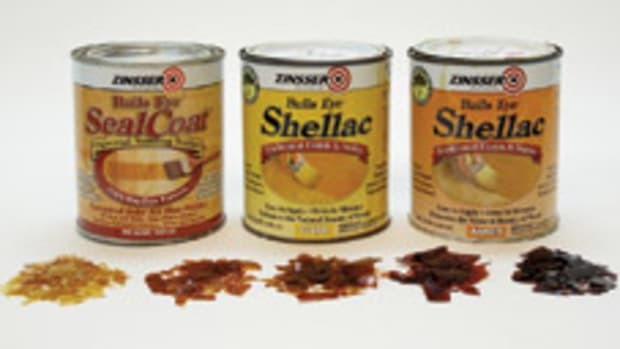 Shellac is available as bags of flakes or in pre-mixed cans. Sometimes the mixes have wax added and that can render the shellac coating a little less resistant to abrasion and also difficult to use with other stains or coatings. Naturally yellow or amber, some shellac is bleached to make it more neutral. 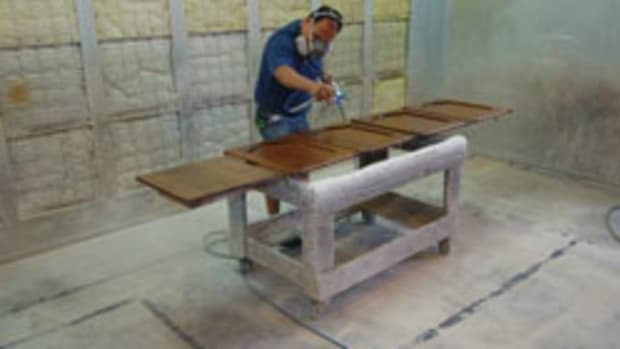 The technique of French polishing involves applying lots and lots of thin coats of shellac and then rubbing them to a glossy shine with a pad. Lacquer is probably the best commercial finish for cabinets. It dries fast, so jobs keep moving through the shop and dust isn’t such a big problem. It has a rich, deep sheen that brings out the natural beauty of grain, color and figure. Lacquer is relatively tough and is ideal for doors, vertical panels and face-frames. Nitrocellulose lacquer, which yellows over time, is the most common variant. It has an alkyd base with a partially nitrated cellulose resin and solvents. (Nitrocellulose is also known as guncotton and in some more intense formulations once was used as an explosive.) The acrylic-based version, also know as CAB (cellulose acetate butyrate) resin lacquer, won’t yellow. Catalyzed lacquer occupies the land between lacquer and varnish — it dries harder than regular lacquer and is a bit easier to apply. Post-catalyzed versions (mixed in the woodshop) tend to have a very short open time. There’s a direct relationship between hardness and gloss in most finishes. Matte and satin finishes don’t reflect light as much, so they can help hide minor defects, but they are often less resistant to impact. Semigloss and full-gloss coatings are more durable, but ambient light reflects off the surface and doesn’t penetrate, so there is less depth to them. It’s a balancing act. Don’t rely on a salesperson alone when choosing a finish. Visit trade shows or drive to other shops around the city, shake some hands and ask what they’re using. You’ll discover the best suppliers that way.